Global Sports Brand PUMA links up with Amsterdam-based fashion and streetwear brand Daily Paper for the first time, for a collaborative collection that’s rich in heritage and playful in nature. Since 2010, Daily Paper has been making waves in the streetwear game with no signs of slowing down. Inspired by the brand’s African heritage and a passion for contemporary fashion, Daily Paper molded themselves into a well-respected creator of authentic ready-to-wear garments. With an emphasis on tailoring and an eclectic use of materials, each garment compliments the consumer’s passion for individuality and personal style. Quality product, fine detailing, culture and great designs give Daily Paper their unique rugged brand aesthetic. Fusing cultural backgrounds with emphasis on tailoring, the PUMA X Daily Paper collaboration for Spring-Summer ‘17 sees contemporary styles refreshed with bold graphic execution and subtle design details. The collection’s inspiration stems back to East African origins with Masaai cricketers at the forefront. Styles from PUMA archives are reinvented with clean cutlines, colorblocking, and patterned trims that genuinely reflect the Masaai people and their history on the pitch. Each piece in the collection is decked with rubberized branding, making an already unique piece, even more official. The PUMA Match, a renowned classic, is a key style that makes this collection even tougher. Daily Paper reinvents the classic in three renditions – one decked in Velcro straps, another in classic form with an all-over paint splatter effect and the last with a colorful translucent sole, each equipped with premium leathers and bold branding. Another silhouette that Daily Paper takes to new levels is the Court Platform. 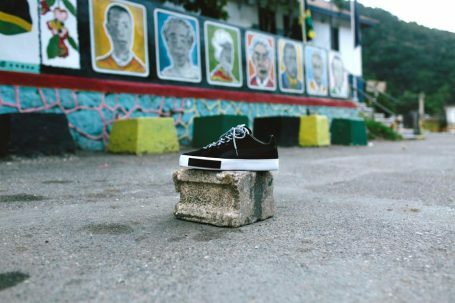 With a platform sole, premium knit and leather uppers, this style is both diverse and edgy, appealing to both men and women. Head turning seasonal speckled print and premium materials are consistent across the range. Executed on archive pieces that are ready for the streets, including sweats, polo’s, shorts and parka jackets. Each statement style is contemporary and stylish, combining street- ready designs with diverse bold graphics, signature to the Daily Paper’s penchant for eye-catching collections. The PUMA x Daily Paper collection for Spring drops on February 24th through PUMA.com and select retailers worldwide. The Summer range will be available in stores in April.